I know what you are thinking, what are PVP Plants? 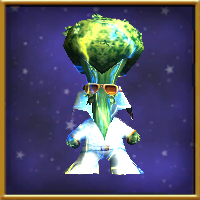 Many of us already garden for snacks to feed those endless pet fails, but I am here to show you that gardening can also be a great way to obtain those rare treasure cards that can be so useful in PvP. There are many plants in the spiral that drop treasure cards, but for the purpose of this article I will cover the ones that drop rare and/or hard to find ones. Of course at the end of the day it is up to you on which are most valuable and/or worth your time and effort! Happy Gardening! You have a chance to get these seeds in Farley’s Gardening pack. They also drop in the Ultra dungeons, at Baba Yaga, or Aphrodite. You can receive these as a drop from regular Alligator Pear Trees (rare chance at elder harvests). You will get one seed at elder, which can be either a regular or an ultra alligator pear tree seed. Pros: Only plant to drop Potent Trap TCs. Cons: These seeds are difficult to obtain in quantity and they only have a chance to drop an ultra seed at elder. 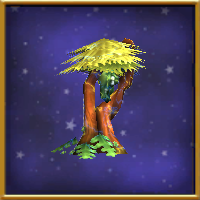 Since the TCs we want are at elder harvest only, wilt and revive will not work with these and eventually you will exhaust your supply of seeds. Both Potent Trap and Sharpened Blade TCs are no Trade, making it difficult to supply multiple wizards. I say just plant what you have and don’t worry about it. You have a chance to get these seeds in Farley’s Gardening pack. They also drop in the Ultra dungeons, as well as at several bosses in Polaris. 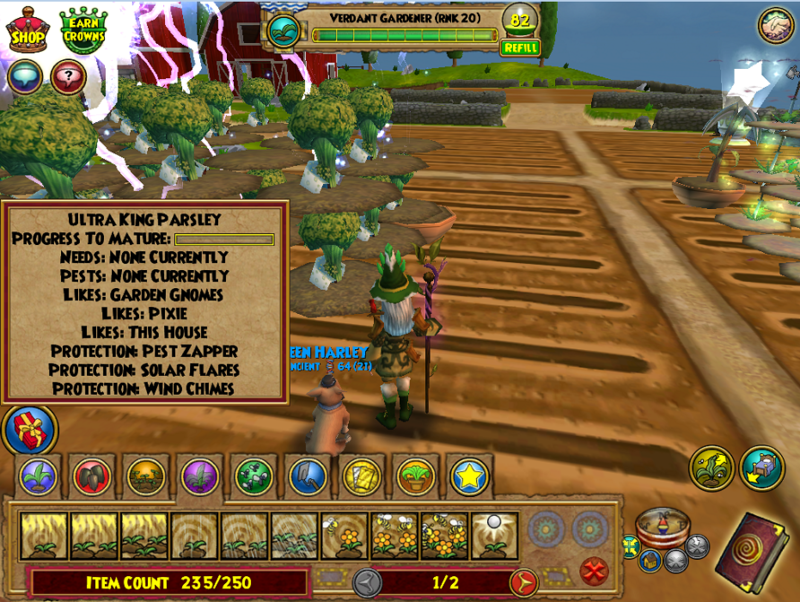 You can receive these as a drop from King Parsley (rare chance at elder harvests). These have a chance to reseed at both Mature and Elder. Pros: Unlike other Ultra seeds, by wilting and reviving these a few times before eldering, you can keep a steady supply of seeds. Cons: Bad Juju only drop at elder harvests, so it is tricky to keep up with the seeds. What I do is plant say 15 in a 50 plot garden, be sure to catch mature harvests to accumulate more seeds, then wilt them when they get close to elder and add the new seeds. Once the garden is full I will let it go to elder and start the cycle again. 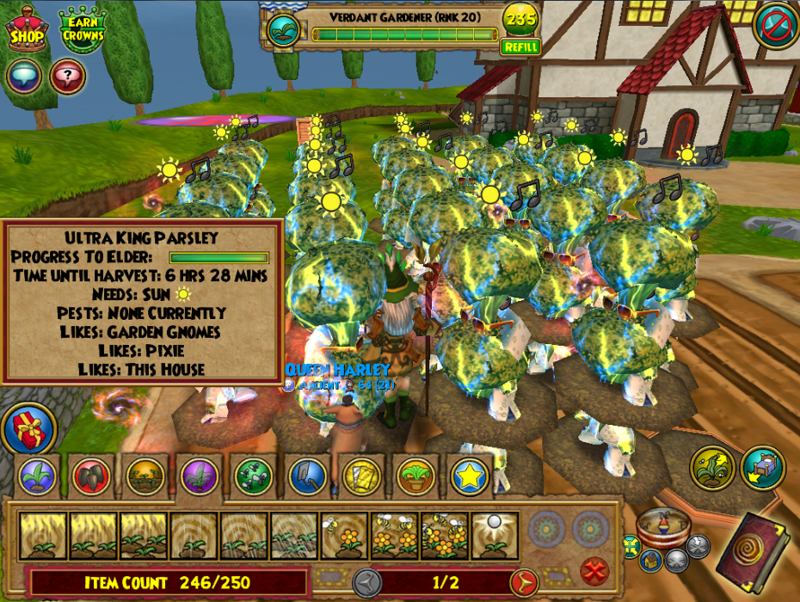 I probably have a yield of 8-9 Bad Juju TCs with a 50 plant garden at elder. Considering the intermediate wilt/revives that probably means 8-9 Bad Jujus per month. These will not enable you to become an instant off-school juju spammer. Keeping that in mind, unless you really covet these cards, it is probably not worth your effort. I carry like 1 in a deck on each of my wiz for use in critical situations and even then I am pretty stingy with them. You have a chance to get these seeds in Farley’s Gardening pack. They also drop in the Ultra dungeons, at Rasputin, or Aphrodite. 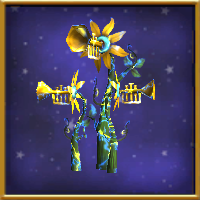 You can receive these as a drop from both Trumpet and Silver Trumpet Vines (rare chance at elder harvests). You will get one seed at elder, which can be a regular, silver or ultra trumpet vine. Pros: They drop all the school “firegut” spells from the 5 boxes. Cons: These seeds are difficult to obtain in abundance and they only have a chance to drop an ultra seed at elder. Since the TCs we want are at elder harvest only, it is very difficult to keep a steady supply of these. No harm in planting a few if you have them though, as they do elder quickly. 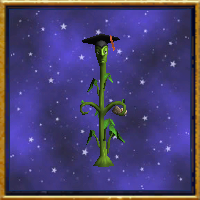 You can buy these seeds from Farley in Wizard City, Golem Court for 1,200 gold, but first check the bazaar as they may be cheaper there. 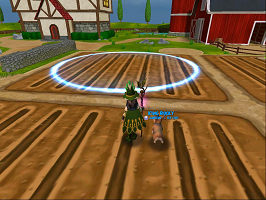 These seeds are also dropped throughout the spiral so if you happen to get some in your travels try them out! These don’t reseed at all. 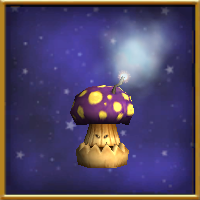 Pros: Boom Shrooms with all likes can go from seed to elder in 2 days! Plant them a few times and you will have enough Freeze TCs to last, no more begging off of friends when the Bazaar runs out. Additionally, if you do team PVP, the smoke screens and cleanses are an extra bonus, just sell off all those pesky sandstorms and use that gold to buy more seeds. Cons: These plants do not give a seed at elder, so you will have to buy a fresh batch every time you plant them. Try not to let this deter you though, because the TC yield is quite high and you should have a good stock of cards in no time. 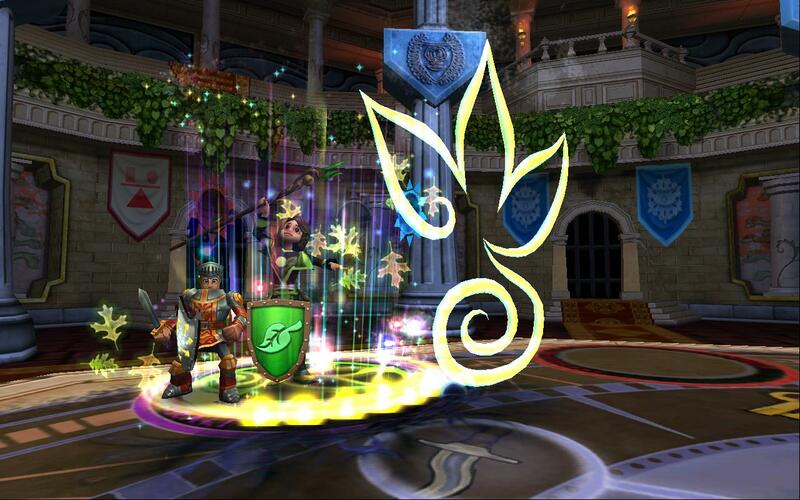 Sword Ferns can be bought in the crowns shop and are also dropped at several bosses in Khrysalis or mobs throughout Mirage. These reseed at Elder, so you’re guaranteed to get the seeds back. 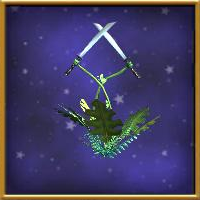 Pros: These plants are easy to care for and they drop sharpened blade, which is very nice if you are too low of a level to train it or if you simply need another stackable blade. Cons: I do not see any downside to these, they are much easier to get than they once were. They are easy to care for and great for doubling during member benefits. Keep in mind however that sharpened blade TCs are not tradeable, so whichever wizard is using them has to garden them. This previously hard to find seed now drops throughout Mirage and can also occasionally be found in the Bazaar. These reseed at Elder, so you’re guaranteed to get these back. Pros: They drop colossal, gargantuan, extraordinary, unstoppable as well as many useful auras. Cons: Treasure cards only drop at elder harvests and are evenly distributed with snacks, meaning you will get either a snack OR a treasure card. Also consider that they need quite a bit of energy to care for. 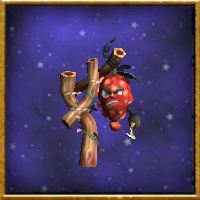 Red Grapes of Wrath are dropped by mobs and bosses throughout Mirage and can also usually be found in the Bazaar. 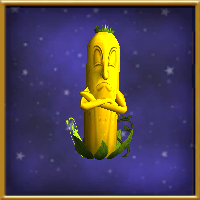 NOTE: This is one of the few plants that dislikes Tropical Garden Gnomes, don’t use one! There is a chance of a seed at the Elder harvest, not guaranteed. Pros: Great if you are too low of a level to buy Gargantuan TCs or do not want to craft them. Cons: They have a lot of needs so they will require a lot of energy to care for. These plants only have a chance to reseed at elder. However, the cycle time to elder is very long so you will get many mature harvests before that. 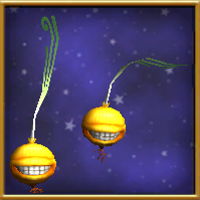 As a result of their long cycle time, using wilt/revive works very well with these to preserve your seeds or you can just let them elder and buy new ones. 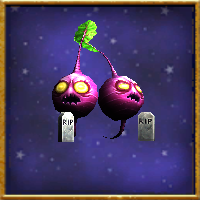 Dead beet seeds are farmable during Halloween in the Mysterious Cave, home of Nosferabbit, the drop rate is quite good! There is a chance of a seed at Elder, no guarantee. Cons: These seeds only have a chance of a seed at elder, so you have to be careful to wilt/revive or constantly replenish the seeds. Formerly only available via crowns, these seeds are now dropped by almost every mob in Mirage. So find your favorite/easiest mob to kill and have at it! You do not need many, 10 is more than enough. They are prolific and will give you an overabundance of their TCs in no time. Sure, I grow these for the Triage, but those Sacrifice and Availing Hands can also be handy! This plant is guaranteed to reseed at Elder. Pros: You will never have to farm the Bazaar for Triage again (nuff said)! Cons: I see no downside to these as they are very easy to care for and grow. You may wind up with way too many cards, but you can always sell them off or share with your less fortunate friends! These used to be only available in the Crowns shop, but with the release of the Evil Plant Lady (Aphrodite) we began to see them as drops. Even better news, these can now be farmed for in Mirage as well as the Key boss dungeon, Ra in Krokotopia! I started out with 9 on one wizard and being careful to time double gardening rewards now have full gardens (67 plants) on 4 of my 6 wizards. These are guaranteed to reseed at Elder. Pros: Drops the coveted Colossal TC as well as being the only plant to drop Super Nova. Basically your one stop shop for damage and accuracy enchants! Cons: Colossal, Gargantuan, Unstoppable and Extraordinary TCs only drop at elder harvests and the cycle time is quite long. Additionally; Colossal, Extraordinary and Super Nova are no trade so you may have to plant these on multiple wizards if those are the cards you are after. 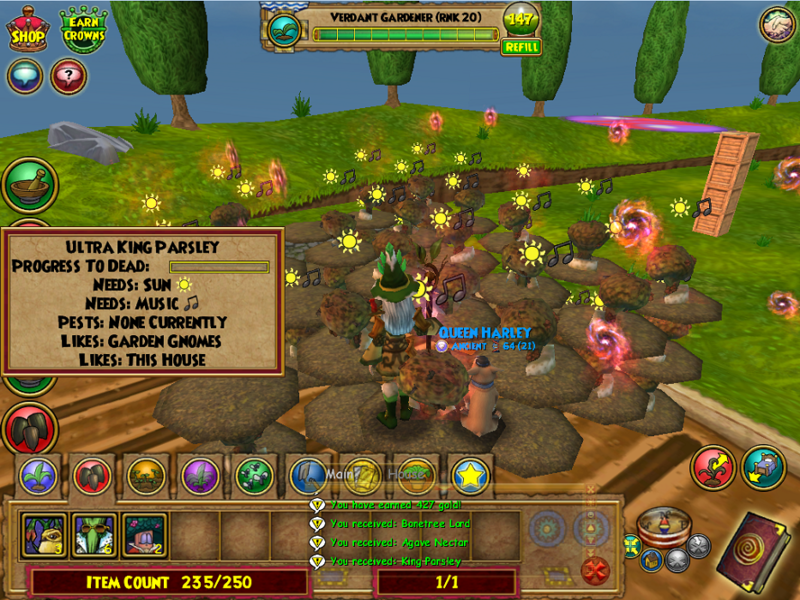 Wilt and Revive refers to a method of gardening where you do not allow the plant to elder. This can be helpful in cases where plants do not reseed at elder and you do not need any of the drops from the elder harvest. This method is also used to preserve pixies on “pixie plants” or in case of the Ultra King Parsley, to multiply your seeds. When the progress bar is getting close to elder DO NOT care for the plant’s needs, If you have new seeds to add to the gardening plot do so at this point. Generally I do this earlier, that bar is pretty close to done! Leave the garden for at least a day, also keeping in mind the seed to young cycle time on the new seeds you added. I have found in most cases 24 hours is plenty. Be sure to take care of ALL their needs and voila, your plants are young again. The additional seeds you added will also be young, so everything will be in sync. You do not need a giant stacked plot in most cases to get what you are after. Plant a few seeds and work your way up from there: something is better than nothing. If you are interested in learning to stack plants, visit this great guide here. You do not need to have all the plants “likes”, but each one you do have will decrease the growth time needed for plants. In some instances you may actually want them to grow slower and use less likes. For example, with my Ultra King Parsleys, I put all the likes to progress them to Mature as fast as possible and then take them away once the plants are mature. That way, I can harvest them in 12 hour cycles. No need to put 2 or 3 of each like, if it fits in a large spell ring, the plants they will “see” them, see picture above. When doing mixed plants in one gardening plot, be careful. One plant’s plants like may be another’s dislike! Consider grouping plants that have similar needs so you do not overextend yourself energy wise and wind up with dead plants. 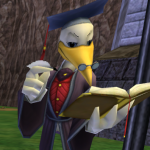 Speaking of Energy, be sure to peruse our Energy Gear guides, Level 50 & 60 and Max Energy. Do NOT visit your gardens unless you have the energy to care for all the plants there, needs will not show up until you actually go to the garden. Do you have a favorite plant for Treasure Cards not listed here? Have any questions? Let us know in the comments below!